The Bottom Line: A hate-filled rant that demonizes the law enforcement community. Scholars of activist fiction, however, may find this diatribe on police corruption a fascinating work of art. When it comes to politically charged fiction, two seminal works come to mind. The first, E.L. Doctorow’s The Book of Daniel, is a novel about two convicted spies executed by their own country, and highlights the hypocrisy of American culture. The other is John Steinbeck’s In Dubious Battle, which depicts the plight of marginalized California apple workers. Both works are somewhat subtle in their use of narrative to drive home a feeling of sympathy that works on both conscious and subconscious levels. There’s no such subtlety in Leonard Love Matlick’s Cops Lie! 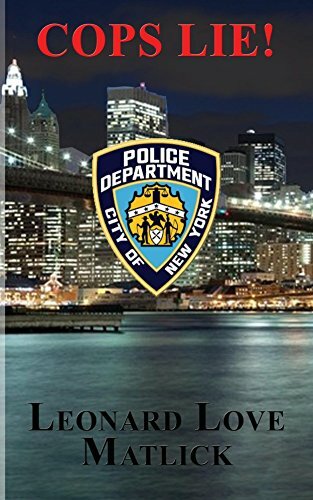 The book follows Homicide Detective Tony Philadelphia as he investigates a rather nasty case of NYPD police corruption. In a more traditional narrative, you might expect Detective Philadelphia to be a likable hero at the outset, only to eventually discover that he’s just as dirty as the mess he’s tasked with solving. But Matlick brings a sledgehammer to every page, creating a nonstop screed against the police community that never lets up. At first, Matlick’s stereotyping was so complete that we thought it must be the point of view of an extreme character who’s identity and trauma would later be revealed. That never came to pass, so we checked the book’s Twitter account and found that the posts there were indeed consistent with the book: an endless assault of problems without perspective, background or solutions. So will Cops Lie! persuade anyone into activism, or is Matlick just preaching to the choir? Perhaps neither. The book’s message is so utterly hopeless, it doesn’t seem to suggest that action will do any good.